Royal Wedding of Prince William and Catherine Middleton Instantly Stamped! 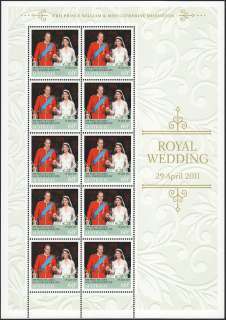 Just days after the Royal Wedding of Prince William and Miss Catherine Middleton, Australia Post is commemorating the historic event with the release of an instant stamp sheetlet to complement the official stamps issued on 12 April. The instant stamp issue features an image of the joyous couple taken on their wedding day. “The official stamp issue has been very popular, with a number of post offices making additional orders to keep up with the strong demand. If the public’s response to these stamps is any indication, we expect the instant stamps will be well received. We are encouraging stamp collectors and royal fans to put their orders in early to avoid disappointment,” said Australia Post Managing Director and CEO, Ahmed Fahour. “Australia Post has a proud history of commemorating significant events with instant stamp issues. Our first instant stamps were released during the Sydney Olympics in 2000 to recognise the gold winning performances of our Australian athletes. Earlier this year, we released our first charity instant stamp to support those affected by the Queensland floods,” Mr Fahour said. The stamps are able to be released within days of the wedding due to special technology that allows the images to be uploaded into a Royal Wedding stamp template, pre-approved by Buckingham Palace.